Screenprint on Strathmore Bristol paper. Edition of 150, 10 AP, 1 PP, signed and numbered in felt pen lower left. 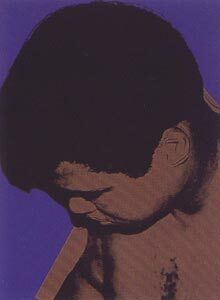 Muhammad Ali: Warhol shared a wonderful relationship with Ali, and created many different pieces using his image. In 1978 Muhammad Ali posed for Warhol and he photographed him in a marathon session.